Random extract from my old diary! I still have a diary but I hardly write in it anymore. Which is generally a good thing, because I tend to only write musings & emo stuff haha. So it's a good sign! Wrote stuff like this in 2006 to practice my vocabulary for the OLevels! Writing narrative essays were always quite fun. 11 comments on "Circa my younger self"
Defug your diary so artsy-fartsy action packed one! My diary is like "Today i ate an apple" "I am very happy today" Lolol. World apart. Thanks for sharing diary entries, it's always amusing to look at back on diary entries. I have diaries too and it always makes me laugh seeing how emo I was about things. publish the full version of the essay please ! OMG. 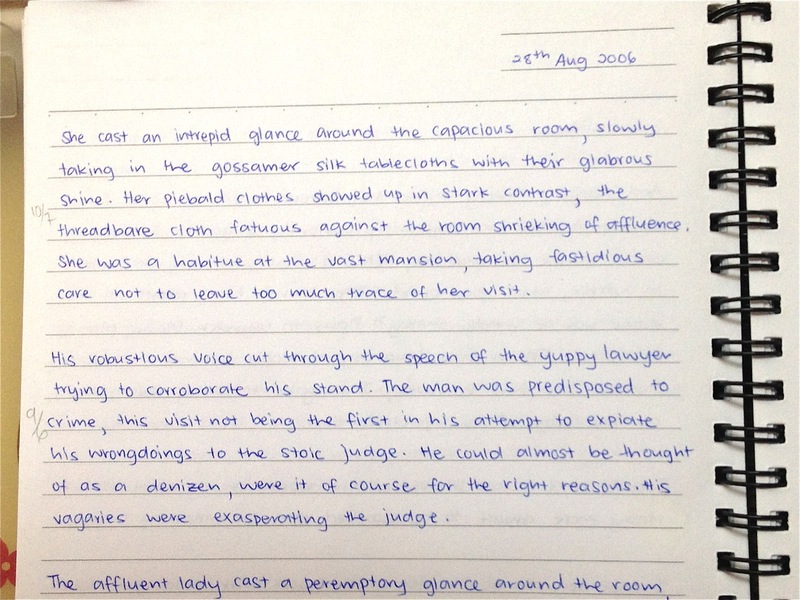 What did you get for English in the O levels? I think your "messier" handwriting looks nicer! Gosh, you can consider selling your 2006 diaries to those english essay publishers!